Trans Mountain: Done deal or dead in the water? The project faces stiff opposition from a new government and legal challenges by First Nations and others. KINDER MORGAN CANADA’S President Ian Anderson seems confident his company will soon break ground on the Trans Mountain pipeline running from Alberta’s oil sands to a coastal terminal in Burnaby. 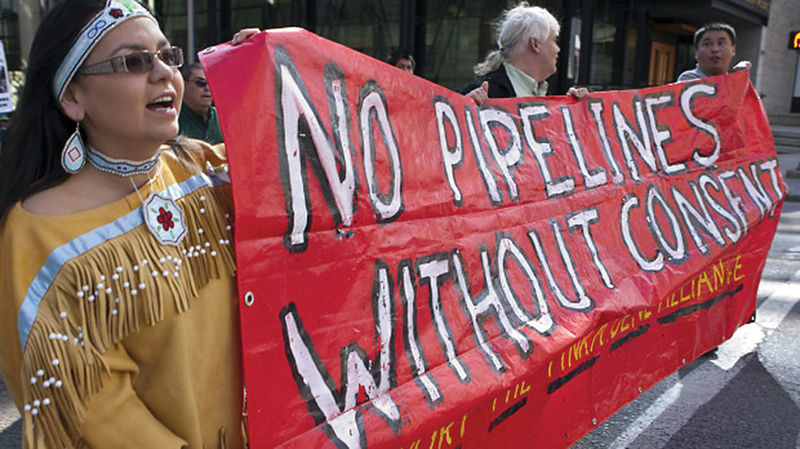 The federal government approved the pipeline following a National Energy Board recommendation. And Alberta Premier Rachel Notley is acting as if the pipeline’s a done deal and dismissing BC’s right to control its coasts. It was a far cry from former Premier Christy Clark’s agreement that, subject to conditions and a 20-year revenue-sharing deal, worth up to $1-billion, construction of the 1150-kilometre pipeline could go ahead. But even under a Clark government, there were growing doubts about the viability of the plan to triple the capacity of the pipeline to 890,000 barrels of diluted bitumen a day, with the number of tankers in the Salish Sea increasing seven-fold to about 400 a year. Now, with a new provincial government, an aroused public, and perhaps most important, strong First Nations opposition, the battle lines are being drawn. AT LAST COUNT there were 19 legal challenges to Kinder Morgan’s Trans Mountain pipeline expansion project wending their way through the courts. These court cases will test the power of First Nations to demand meaningful consultation, along with the extent of Federal powers. They will also assess claims by First Nations and others that Canada’s environmental assessment process is fatally flawed. “It’s not going to happen,” said BC Green Party leader Andrew Weaver. He suggests pipeline supporters such as Alberta Premier Rachel Notley and Prime Minister Justin Trudeau look at Section 35 of the Canadian Constitution which protects aboriginal and treaty rights, including those of “meaningful consultation,” and is increasingly used as a legal tool by First Nations arguing that they have not been adequately consulted. As an example of consultation-gone-wrong, Weaver pointed to the case filed by the Coldwater Indian Band, whose territories are in BC’s southern Interior region, challenging the National Energy Board’s approval of the pipeline. “It’s an incredibly compelling case. The proposed pipeline sits right at the top of the aquifer which is their only supply of water and it is not as if there was not an alternate route. It was discussed and deemed to be more expensive,” Weaver said. Prime Minister Trudeau also has to figure out how pushing through the pipeline over First Nations objections could possibly square with his commitment to the United Nations Declaration on the Rights of Indigenous Peoples. That declaration requires consent for such developments, Weaver noted. Previous governments resisted signing the declaration because of fears it would effectively give First Nations veto power over major projects. But Eugene Kung of West Coast Environmental Law legal counsel said there is a difference between consent and veto and, with the shift in aboriginal law in Canada, the distinction needs to be publicly clarified. Sixteen judicial review cases, which include challenges by seven First Nations, the City of Vancouver, City of Burnaby, Raincoast Conservation Society, Living Oceans Society, and Democracy Watch, have been consolidated and will be heard by the Federal Court of Appeal, likely this fall. If there are appeals, the issue could be heading for the Supreme Court. Another challenge has come from two Washington State tribes over the effect that vastly-increased tanker traffic will have on endangered southern resident killer whales. Even though the judicial review cases have been consolidated, each First Nation challenge is based on unique facts, according to Kung. “Each First Nation has an independent right to be consulted and accommodated in projects that affect their territories…Success on any one of the First Nations legal challenges could delay or stop the project,” he said. Enough delays, and Kinder Morgan could find it all too expensive to proceed. Kinder Morgan says it has agreements, amounting in total to over $300 million, with 40 First Nations, though it will not identify them. It’s presumed many of these are at the Alberta end of the pipeline. At the crucial and densely-populated Lower Mainland part of the pipeline, opposition is strong. Most of the First Nations there are involved in the court cases (e.g Tsleil-Waututh, Musqueam, Squamish, Sto:Lo, Kwantlen). On Vancouver Island, some First Nations, like the Ditidaht, Pacheedaht, and Pauquachin, have signed agreements with Kinder Morgan in order to be eligible for spill response funding. In all, though, at least 13 First Nations in BC are formally opposing the project. The legal climate around aboriginal rights and title has undergone profound changes since the 2014 Tsilhqot’in decision that, for the first time, recognized aboriginal title. Combined with other recent court decisions that have favoured First Nations, including the scuttling of Enbridge’s Northern Gateway pipeline, the game has changed. In the Enbridge case, the Federal Court of Appeal overturned the Harper government’s approval of the project, after finding the Canadian government failed to properly consult the First Nations affected by the pipeline. While the Province of BC under Christy Clark formally approved the Trans Mountain expansion, it is contingent on 37 conditions being met, in addition to 157 from the federal approval. Any of these may provide First Nations and the Province with more ammunition in their resistance to the Trans Mountain project. John Horgan, NDP leader and premier-designate of BC, has indicated he’s prepared to go to court over the pipeline expansion project, and will likely join one of the legal challenges. The Alberta government has already been granted intervener status in the judicial review—advanced by municipalities, First Nations and environmental groups—challenging the National Energy Board’s recommendation as well as the federal Order in Council approving expansion. Phillip continued, stating that investors must be concerned about the court cases, especially in light of the Rio Tinto ruling last year that gave aboriginal communities the right to sue for compensation if their rights are infringed. Investors, he noted, will also be concerned about the likelihood of protests. “It does not have a social licence and it will never have one in British Columbia,” said Weaver. “I would suggest that if they start drilling under Burnaby Mountain…this will create a crisis like this country has never seen before,” he predicted. Some in the resistance movement are saying it will rival Clayoquot protests or those at Standing Rock. Kinder Morgan, in its prospectus released to raise $1.75-billion for the project, acknowledges that court actions could delay or even halt the project. Yet the company also says all financing is now in place and it is starting to move ahead with contracts and benefit agreements with the aim of starting construction in September. EVEN THOUGH the Province of BC cannot block a federally-approved project, there are a number actions that can be taken by BC, according to environmental lawyers. A legal toolkit for provincial action released by West Coast Environmental Law suggests that BC could impose more conditions and/or prohibit any new provincial approvals or permits, and suspend existing approvals until new conditions have been met. It points out the constitutional obligation of the Province to protect First Nations’ rights. “And there may be injunctions filed. I am sure that the First Nations involved have considered that option,” Kung said. Jessica Clogg, West Coast Environmental Law executive director, suggested that the Province could also require that Kinder Morgan demonstrate that all indigenous people affected by the project have provided their “free, prior and informed consent”—as required under the UN Declaration on the Rights of Indigenous Peoples. That free and informed consent would certainly not be coming from the Tsartlip First Nation whose territory lies along the east coast of Vancouver Island, and from which Tsartlip residents would be able to watch tankers carrying diluted bitumen through the Salish Sea. The Tsartlip, like other First Nations on southern Vancouver Island, had a “middle depth of consultation” according to the federal government. Tsartlip Chief Don Tom said, “We are fundamentally opposed to any increases in tanker traffic that would affect our rights out in the Salish Sea.” The Douglas Treaties, he noted, protect their right to hunt and fish as they did before European settlement. A particular concern, Tom added, is the health of the resident killer whales, which are considered relatives by his people. “There’s no chance this is going to happen. Based on today’s political landscape, it’s dead in the water,” he said.